On the nose, Blanton’s can be a little tight, meaning that you don’t get a lot of scents right away. However, if you let the bourbon sit for a while, notes of caramel and vanilla arise. There are some lighter notes of fruits and flowers that linger in the background. 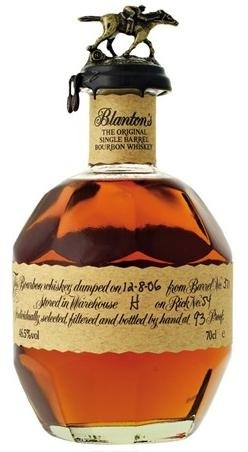 On the palate, Blanton’s has a smooth, but full-flavored mouth feel. There are good notes of caramel, toasted almonds and coconuts, vanilla, and some apple cinnamon spices. The finish is long and smooth, with sweet roasted vanilla, oak, and coconut. As the finish goes on and on, some light floral notes present themselves. Overall, Blanton’s Original is a very good, drinkable bourbon. The bourbon seems tight at times, refusing to demonstrate its full flavor profile. The finish is the most impressive part of the whiskey. Blanton’s has a long, complex, but very soft finish. It is a rare achievement among bourbons. My grade: B. Price: $45-50/750ml. This is really good stuff, and it would be in my cabinet at all times if it didn’t cost so damn much.